I’ve been thinking a lot lately about why some companies make it and others don’t – especially small entrepreneurial companies – and why some grow and others stay right where they started, with every day a struggle. 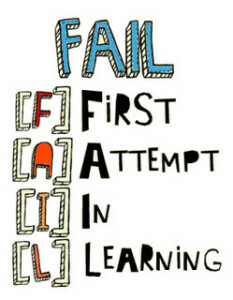 I think it has to do with speed to fail and the ability to pick yourself up, learn from the failure and start over. Great businesses morph over time into what they eventually become. One hit wonders rarely survive in the long run. One of the challenges one hit wonders face is that they often don’t know exactly what they did to make it successful in the first place, it just happened. Now the founder or team live in fear that they can’t replicate what they just did with product number two, or enhance product number one because they got lucky. Yes, luck plays a big part in business start up success. A good concept has to be at the core of the business but who you know and how you go about bringing the product to market can be a lot about being in the right place at the right time. And if you’re thinking of a start-up but don’t consider yourself a lucky person, put your money back in the bank and go back to your 9-5 job.Whether you are or are not lucky, you have to think you are otherwise, you are limiting your opportunities by your negative belief. Ideas are a dime a dozen. I probably have 5-10 ideas for my business every day. Only a couple of them are worth spending some more time on and only a very few get to the stage that need serious consideration and investigation. A start-up should be a lot like a good product development process.Concept, research, review, test, troubleshooting, market scope, SWOT, rinse and repeat. At the early phase of a start-up, the business is a product and not really a business yet. A lot of Silicon Valley start-ups don’t even have revenue, which for most of us mortals, defines an actual viable product! So in the “concept” phase, you need to be prepared for failure and not only expect it, relish it because ultimately, it will make the product or service better. You need to be open to other opinions, other points-of-view and incorporate those into your original idea and see what makes sense to you. Ultimately, the failures will lead you to the right product or service, or on a completely different path. The only time that failures don’t lead to something better is when there is a refusal to believe that the original idea wasn’t sound or solid, that it needed work or modification. Again, hanging on to a “belief” will keep you stuck.Open up just the possibility of “what if” and see what shakes out. This goes for the business that is stuck with flat revenue over several periods, what needs to be changed, ditched, re- examined? As the gold miners used to say, “there’s gold in them there hills,” in the failure, there is gold, but the mining gets a little tougher so don’t give up, learn from it.